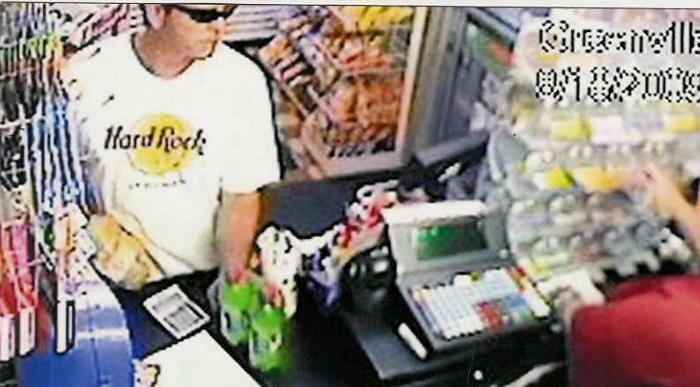 On Tuesday, August 18, 2009 at approximately 8:46. p.m., the Greenville Police Department responded to Clark Oil, 1205 Sweitzer Street on the report of a robbery. The complainant advised that the suspect entered the store with a paper bag covering his right hand and a glove on the left hand, and demanded all the money in the cash register. He then fled on foot. The suspect is described as a white male, approximately 5'10" to 6'1" tall, medium build, very tanned, with short dark hair, and he was wearing dark sunglasses, a white Hard Rock Cafe shirt and black shorts. Anyone with information is asked to contact Detective Eric N. Roberts of the Greenville Police Department at 937-548-4150. I can't believe that nobody knows this low life. We need to get cowards like this off the street. Possibly a Carney? Look around the Fair. I bet he could possibly have tattoos on his hands. Uncle Don? When did you go to the Hard Rock Cafe? Make sure you don't forget me when you're splitting up the loot. And what's with your hand in the bag? Really? We're doing that now, are we? LOL!!!! The guy needs a tan! Glad everyone thinks this is a big joke! What about the poor cashier who thought he had a gun?! What if he did have a gun? Would you think it's so funny if she had been shot?